This is a project about dynamism. Shanghai can be described as a city that underwent an exponential urban growth in the past 30 years making it the most populated city in China today and the second largest metropolitan area of the world. Zooming out to the larger scale, a study showed that 1 of 5 people in the world live in China and 60% of them live in urban areas, thus emphasizing the significance of cities in our days. In the last decade, the population in Shanghai has increased by 40%. The urban extent of the city has trippled in the last 30 years. In the same period of time, the metro system has grown to 644 km length. Traffic congestion has increased by 5% since last year, which is reflected in an additional 46 minutes of extra commuting time per day. PM2.5 particles are quite hazardous in the long run and Shanghai is currently suffering from its effects with expectations of 1.6 million premature deaths per year. The number of expatriates living in Shanghai has risen by 70% between 2005 and 2015. Similar to other neighborhoods of Shanghai, Red Town has been transforming in the past 60 years with its components continually changing and re-adapting to market demands and new decisionsFrom 2020 on, citizens of China will be assigned a 3-digit value, which will express their degree of trustworthiness. This short introduction shows Shanghais current state and how it has been shaped to look like that. But how will it look like in the next 30, 50 years? With the research and analysis phases in mind, we found ourselves trying to find answers to the following questions: Can we foster preventive strategies to avoid certain limits? 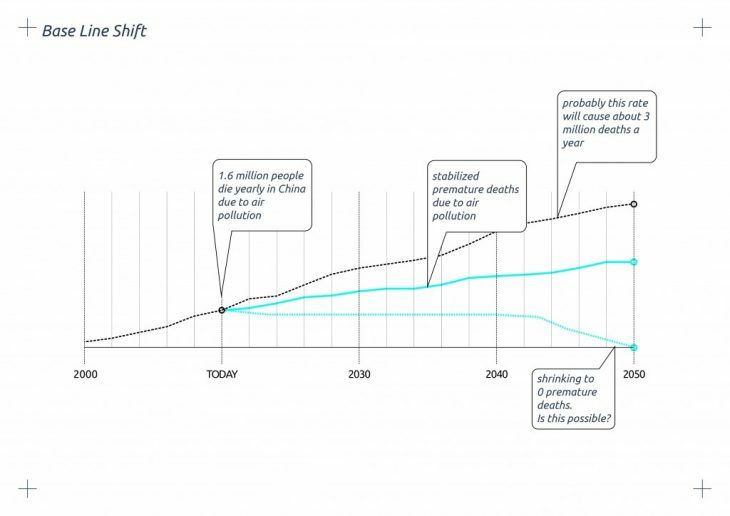 How will visualizing real-time impact enable “pro-action” rather than reaction? Can we cause a positive disruption that raises accountability, promotes transparency and celebrates diversity? How can we come up with a dynamic process that embraces flux? Normally, humans use information to make decisions. So, what if we would track the city and we would be able to see its effects? Would this help us decide to change some of our behaviours? Would we do it if we could measure how our performance is helping some of the indicators to obtain more desired values? Gociti! is a data-driven system that fosters concious decision-making and participatory democracy. Let´s imagine that the level of pollution has incraised +2,8% the last month and this information on published somewhere in our GoCiti plantform. Then this infomation has been seen by a compay which has the idea of implementing new electric scootes within the city in order to solve this issue. This company goes to the municipality to ask for foundation and out of the budget that the municipality has for the urban department, part of it goes to divelop this project. With this amount of money recieve, the company will install all the necessary equipment to make this project real. Once everything is ready, the project will be launched in our GoCiti platform in form of CAMPAIGN, and rewarding with a number of points if the user joins. So let´s imagine the a user sees the campaign, decides to join it, and once the user makes enought Km using the product, he or she wull ge the points as a reward. With all this amount of points that the user is collecting by joining different campaigns, he os she will be able to exchange them in any place within the list of sponsor of the GoCiti platform, like for instance, a coffee in Starbucks. Since the sponsors are the founders of GoCiti platform, there points will be always back to the circle. 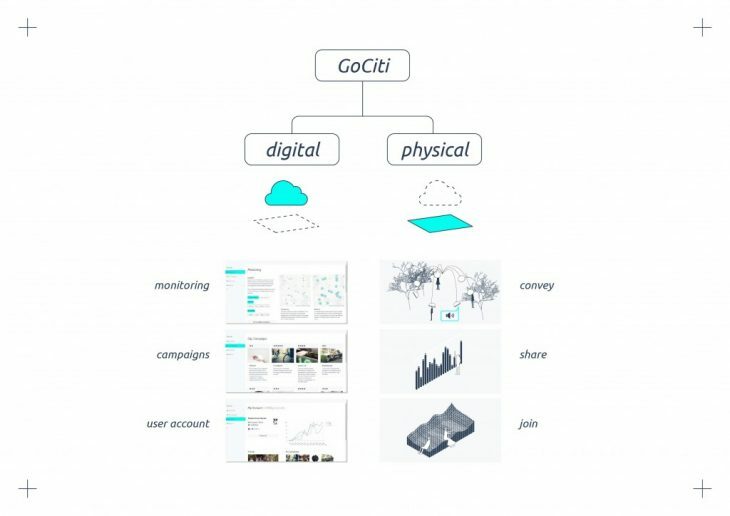 Gociti basically consists on the interaction of different stakeholders of the urban environment (companies, municipality, sponsors and citizens), encouraged by the information derived from the real-time data tracking. 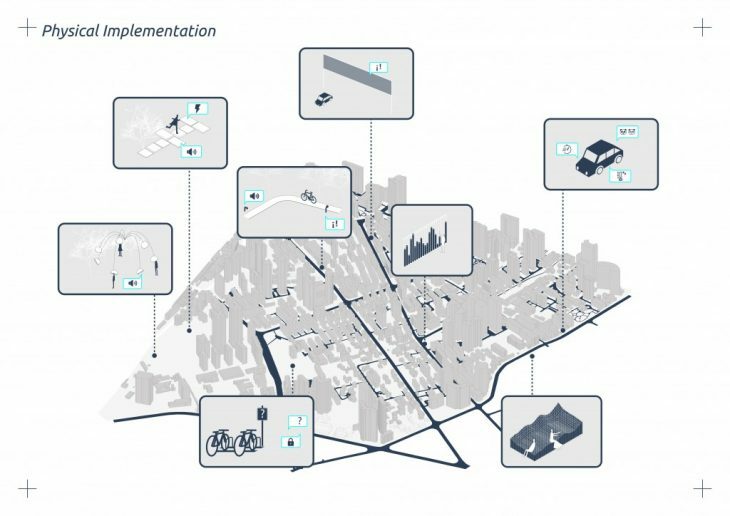 A complete database to describe the city would be splitted in the following chapters: Mobility, Built Environment, Environmental Cleanliness, Ressource Efficiency and Daily Needs. 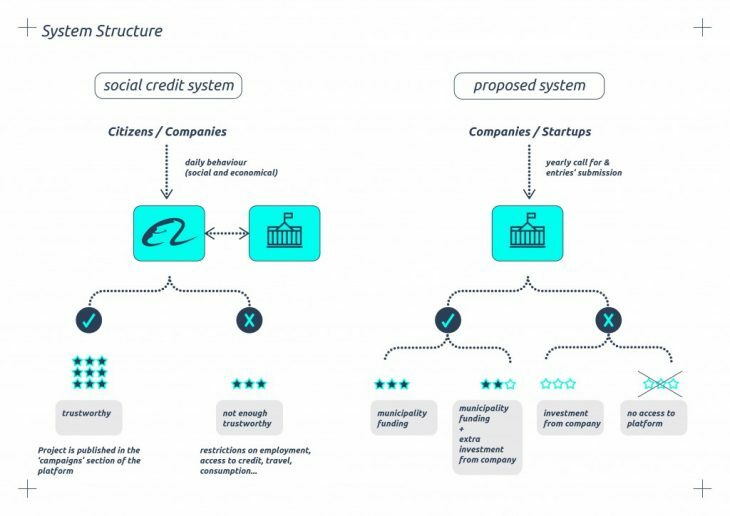 The Chinese government is intending to fully implement the Social Credit System by 2020. Technology conglomerates such as Alibaba will develop an algorithm by which each action of the citizens will be constantly tracked. Out of it, a 3-digit number will express their degree of trustworhiness. Gociti is an alternative system that is also based on data-tracking. However, the main difference relies on the fact that citizens will decide if and when they allow companies to track them. The outcome of it won’t be centered on the citizen itself, but on the effects that the citizens behaviour is causing to the city. Thus, if 10,000 car drivers join Gociti to use Ecoscooter for their daily commuting, the platform will show how pollution levels decrease because commuters changed from using their cars to using electrical motorbikes. Gociti can be accessed both digitally and physically. The digital branch contains mainly 3 sections: monitoring shows the performance of the indicators in form of interactive maps and charts which allow filtering through values real-time comparison; campaings is the section where private and publich companies publish their products, services or initiatives to enable citizens to access and join them. Finally, user account is the personal space for users to check their performance, and share and compare it with their friends. The physical deployment is intended to solve 2 challenges: first, how to convey and deploy real-time information on the public space, to make it easy understandable and interesting to check for all citizens? Second, how to engage people share information about their habits to enrich the Gociti dataset? Of course both questions need to find answers so that all target groups that form the urban environment are properly adressed. Thus, focusing on mobility, a set of proposals has been done adressing drivers, cyclists, public transport users and pedestrians from different ages.